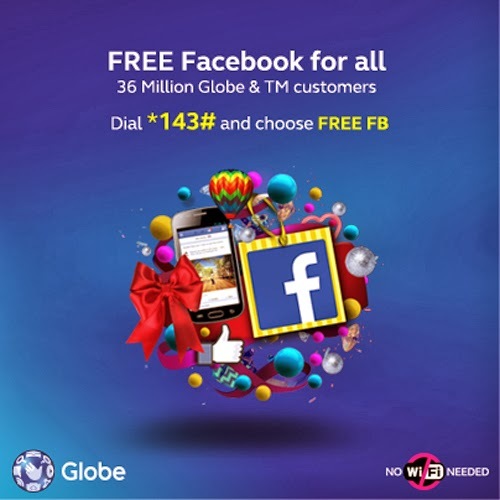 Setting another unprecedented milestone in Philippine telecommunications, Globe Telecom is giving the telco’s over 36 million subscribers free access to Facebook on mobile phones for an initial period of three (3) months. Globe worked closely with Facebook to enable customer experience innovations for the best free Facebook offer yet. Available to all Globe Prepaid, Postpaid, and TM subscribers using feature phones and smartphones* and accessing either through the mobile site of Facebook or the Facebook app, users can post, like, comment, chat, add friends, upload photos, share posts, and more on Facebook without the need for Wi-Fi. Aside from offering Facebook at zero data charges, the collaboration between the two global companies has also paved the way for subscribers to enjoy first-of-its-kind customer experience innovations. Working with Silicon Valley-based Facebook engineers, Globe has put together innovations that cover key milestones in the customer experience journey such as availability of access on feature phones and smartphones across all Facebook mobile platforms whether via the Facebook app or Facebook’s mobile site m.facebook.com; no billshock or “nakaw load” as customers will be notified if they will incur data charges once a link that leads out of Facebook is clicked; and one-click registration to the data plan of choice to continue browsing without having to leave the site. Recommended data plans consider a subscriber’s available prepaid balance and/or megabytes (MB) balance of existing data plan. Moreover, customers with not enough prepaid load can “loan” a 10MB data plan for only P10 which will be deducted on their succeeding top-up so they can fully explore content outside Facebook, making the experience seamless and worry-free. “Once again, Globe has proven that it is the mobile data service provider of choice by industry and technology leaders around the world with this breakthrough partnership with Facebook to give our 36 million subscribers uninterrupted, seamless, and worry-free Free Facebook experience. This is collaboration at its peak, which has resulted in the best and most innovative Free Facebook experience yet,” said Peter Bithos, Senior Advisor for Consumer Business at Globe Telecom. Starting October 31, 2013, subscribers can dial *143# and select FREE FB to know more about Globe Free Facebook.